Promods is great! I have seen a lot of new stuffs. New traffic light designs, new kind of road, bridges, cities, signs, all detailed and perfect. But do not expect for a lot of amazing landscape… With these new things putting in Promods, I haven’t experience any frame-loss which is awesome. With the new version, it includes cities from Northern Scotland, Iceland, Fjord Islands, more cities in France, reworked cities that ProMods has made, and also reworked stuffs in Scandinavia. Iceland is a cold country, expect for winter stuffs here, new Icelandic houses. On the eastern part of the map, is a cold, lonely road with Icy landscapes. On the western part of the map is where the industrial heart of Iceland is, even the capital city is there. Never expect for beaches here! A small part of the map, it is a small country island. Here you explore the town of Tórshavn which you can’t expect any beaches here, but ports and docks instead. Up North is the hilly side (w/ rivers) of the Island which is Klaksvík. It’s just a village, but in case of some deliveries, sometimes you might have to go there. Where the ProMods part is. Enjoy the new roads, cities, types of intersections in highways and roades, traffic lights. Ferry for short trips in the western part of the map. Get into the small cities and with good roads to go with including the landscape. In the middle goes for the capital city of Oslo. Explore the new toll ways and expect more than you expect, the city of Oslo is very big, compare to other normal ETS2 city maps like Paris. The Eastern side is the most industrial part. Tall buildings, industries and complicated roads and highways including new road signs. You may never get board going there! Bounjour! Bienvenue! Welcome to France. 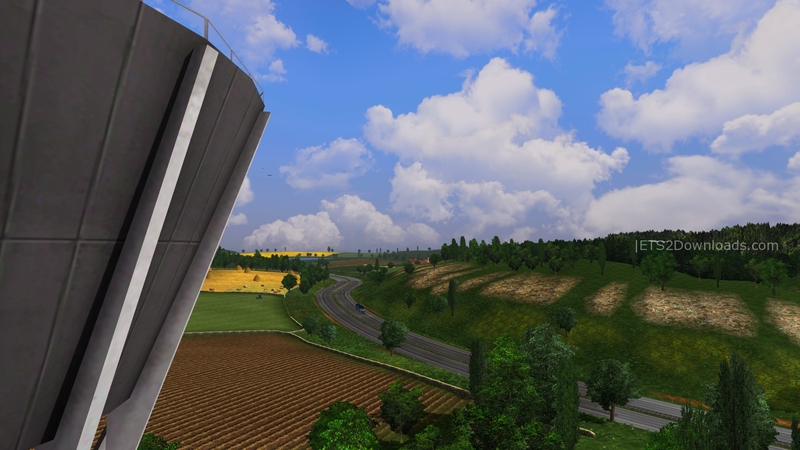 Promods goes south and expect for French mostly plain landscapes, roads and cities to explore. Enter to the amazing bridge in France Enter to the historical landmarks especially one in Mont Saint-Michel. France is still expanding in ProMods, so expect for more in the next updates! Antwerp? Amsterdam? Rotterdam? Vadus? Bergen? All of them are included in the European world. Expect in Antwerp for a very industrial city to explore. Rivers, docks, and bridges, it never seems to complicate you. ProMods made it easy for you to explore all of them. Amsterdam & Rotterdam are improved, so expect for better things there, more of industrial stuffs and roads there. The rest are towns to explore with adds the atmosphere of Europe. Talking about bridges? In this country, expect for big industrial zones, cities and the enormous bridges to connect to and from Scandinavia. It’s one of the only biggest features in ProMods. With good accuracy, it’s just the same thing driving across the bridge with your girlfriend along in real life. Also expect for short ferry connections in the northeastern part of Denmark to connect you from one Island to another. Never thought of ProMods adding roads and cities in Scotland? Yes, go into small towns and fishing ports here and you would love it. Nothing to tackle much about here but all-around it’s interesting. The 1st state has arrived in ProMods. Expect for the Baltic atmosphere with the roads, new road signs and many more. Enjoy the cities to explore there. Nothing to tackle much about here, but it is still awesome to explore. Nothing to tackle much about here too, but the northern parts of Italy are mostly industrious, so expect for the industrial landscapes and atmospheres there. Head to the north, is the Swiss Alps, enjoy the view while driving there. The map mod is compatible with Rus Map, which makes the map a whole lot bigger. A couple of small map mod add-ons can be compatible with it too, but do it with your own risk, and make sure it isn’t conflicting to the Promods part. Run game ~> Create new profile ~> Enable scs files. Note: If you are currently using older version of ProMods (like ProMods v1.8,…), just download this version and replace the old one in your mod folder, you don’t need to create new profile! Wow Promods looks amazing here are my reviews in the *updated countries. Italy: Northern Italy has always been quite industrious ranging from Milan to Bologna you can already see industrial plants along the road. New Italian roads, signs, intersections and road marks so it’s kinda fun to do. Go over Udine and there you can take a photo to the small cityscape and see the bit of farming over the hills looks pretty! Baltic Countries: Well here it’s quite simple, just some new roads and cities and stuffs, but still impressive as a Baltic plain landscape so not much quite to tackle about. Poland: As I have heard, Poland Rebuilding has merged into the whole ProMods, which is cool. 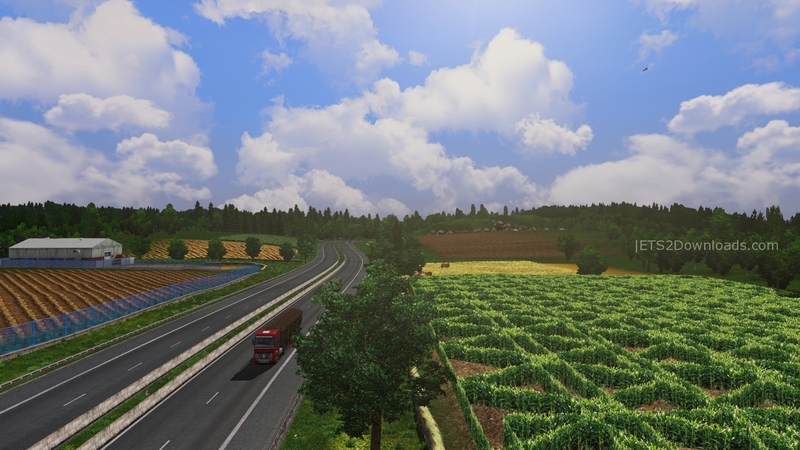 Expect a great polish landscape with new Polish roads, signs, road marks, more detailed and updated cities. More of my full review here: https://ets2downloads.com/maps/poland-rebuilding-map. France: France in ProMods is still intriguing. Expect a French Landscape, new stuffs, new cities, new sceneries, new French road marks, intersections, “bridges”, cities and many more. Explore the famous Mont Saint-Michel down Southern France, though not the whole France has been covered, the project seems very great and pleasing. Explore the new city Toulouse, and feel as if you are driving in real life. Spain: Finally a touch to see the 1st very few parts of Spain. Not to tackle much but explore the 1st 2 cities, and you may want to hint what would Spain look like in the future. Germany: A lot of rebuilt has been made in this country thanks to ProMods. Now Germany looks way better now than the original SCS map. Since Germany is mostly industrious, expect and industrious landscapes with many new cities, roads, road marks to explore. Germany looks really detailed now! England: looks still the same with the previous version, just some new tweaks and a new town made which is Chelmsford. Nothing much to tackle about. 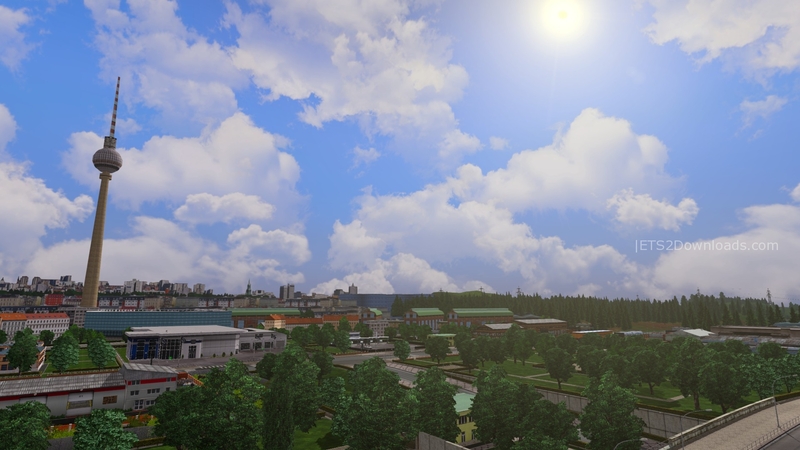 Iceland: ProMods has decided to rebuilt the two major cities of Iceland which looks, as expected better and detailed. The rest looks okay and explore some snowy and hilly parts of Iceland and the industrious west. Fjords: Still pretty much the same review. Great beaches, island landscape, rivers and a good port town to explore a bit. The rest of Europe: Above all most parts of Europe are now very detailed and nice looking thanks to ProMods (don’t forget about Antwerp!) They fixed many bugs and stuffs and added new models and materials to make Europe look very great. ProMods definitely got better, with their map expanded and existing ones upgraded, I highly recommend this mod to every ETS2 user. Rating a perfect 10/10. Sound Fix v14.0 + Realistic Weather Sound + Some Jazzycat Mods + Rus Map + ProMods + Balkans Project + Real Companies mod by ProMods. Hello guys new update ProMods v2.02 for ETS2 v1.23 is now out. It only features some bug fixes, minor tweaks and compatibility update of the mod. Just check the download section in promods.net and you’re ready to go!!! Hello the map is compatible with Rus Map v1.63 & Project Balkans v1.03 enjoy!! is this the promod 2.11 that every other mods requires to run ? ?